Students are calling for the abolition of tuition fees and their replacement with a graduate tax. The National Union of Students (NUS) has traditionally opposed paying for university in any way. At the moment, students in England and Northern Ireland are liable for charges of up to £3,225 a year and universities are lobbying for an increase. The NUS says graduates should pay a proportion of their income into a trust for 20 years after they leave. Money from the trust would then be shared between the universities. Under the proposals, top earners would pay the most - 2.5% of their earnings - while those earning the least would pay 0.3%. A graduate on £40,000 would pay £125 a month, while someone on £16,000 would pay £5. At the moment, in England and Northern Ireland, and for non-Welsh students in Wales, full-time undergraduates are liable to pay tuition fees of up to £3,225 a year from 2009-10. The poorest students are eligible for non-repayable support at up to the same amount and there is a sliding scale of grants, which peak at £2,906 for families earning less than £25,000. NUS president Wes Streeting said the top-up fee system had been "disastrous". "As the first generation of students to pay top-up fees prepares to leave university with unprecedented debt levels, more than half of employers are not recruiting graduates, and experts are warning that unemployment among young people is set to reach the one million mark by September. "This lost generation faces a summer of misery. In this climate it is laughable that some vice-chancellors are arguing that students should pay even higher fees. "NUS' proposals would give universities double the amount of funding they currently receive, while allowing the children of poorer families to go to university without the fear of debt. "They would also prevent the emergence of a market in higher education, where only the rich could afford to attend our most prestigious universities." This summer is the first time students will graduate after three years of "top-up fees", which were introduced in 2006 after intense political opposition, both inside and outside of the Labour party. 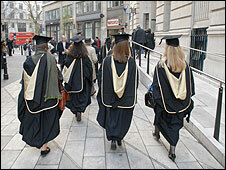 Opponents had argued that the system would put off students from the poorest backgrounds. A spokeswoman for the Department for Business, Innovation and Skills said record numbers of young people were going to university. "There is no evidence to suggest that tuition fees have deterred people from higher education. "Students are supported through generous government loans and grants as well as the bursaries universities offer." There has been a mixed response to the NUS proposals. The body which represents the heads of universities - Universities UK - said it was important to debate the issue, and for students' to be heard, but the present system had brought benefits. Diana Warwick, chief executive of Universities UK, said: "Far from being 'disastrous', we believe the variable fees regime has brought a number of real benefits, not least to students through the removal of an upfront payment and the introduction of generous bursary arrangements". The University and College Union (UCU) said the proposals were a welcome contribution to the debate on the funding of higher education, but it believed education should be free and publicly funded. General secretary, Sally Hunt, said: "The students of today are the doctors, nurses, social workers, engineers and architects of tomorrow. "As a country we should be investing in them rather than seeking to ration access to higher education." Director General of the Russell Group of leading universities, Dr Wendy Piatt, said: "The most pressing need for universities is to maintain their income in order to maintain standards of teaching and research. "However, this is a serious contribution to the debate about solving the problem of the under-funding of higher education which we welcome. "It is also good to see the NUS engaging in a measured discussion about graduate payments, although they have effectively renamed 'student debt' as 'graduate contributions'."